JON - Since about 400 years after Christ. Jacob has a revelation about angles coming in rounds from heaven and earth. Then it seems most of the Christian faiths, including the Muslims. Use this vision it different ways. It has to do with Jacobs Ladder. Talking mainly about the astrology (if you will) and 7 Rungs in the later. And the most compiling story starts about the 16th and 17th century with the Freemasons. Jacob seems to be stating by his description of the divisions in a way that eludes to the 3 degrees of glory. (In the Telestiral their are Angles, Archangels & Principalities, in the Terrestrial there are powers, Dominions, (one more I just don't remember, and in the Celestial there is Thrones, Cherubilm, Seraphims working with the three degree of glories. Each degree seems to have a level of knowledge limit to it and each degree has a set of angles as mentioned above. It seems most of the Christian groups have some form of the vision of Jacob, because it seems most Christian faiths tie the 7 rungs in the latter to not only a Angelical Service (Angels and such) but a lot to do with astrology (Sun = Celestial, Moon = to Terrestrial and stars to the Telestial. Mormonism, we seem to treat Jacobs ladder as more of a knowledge level. Its the rounds that is confusing and its the interpretation of the dream that dates back to about 400 or 300 BC, before Constantine got a hold of it. In the 16th and 17th centuries a lot of information is coming from the Freemason side. Even though your answer maybe long I would like to know if we can tie all of this to levels of knowledge we obtain when leaving this world and the Angels, Archangels, principalities powers, dominions, Thrones, Cherubim's, Seraphim's and such play a part in the 3 degrees a glories and the part it plays. The rounds within is the pathway Jesus took to be Christ and God. A pattern of which we must take to become God's. Reading most of the interpretations of the visions from most of the Christians and even the Muslims Jacobs latter is inclusive to suggest that it looks like the Plan of Salvation. Is it so, or am I way off base on the vision of Jacob about the Ladder of Knowledge. JOEL - My answer is not too long because Jacob's vision is described in only a couple of scriptures and any explanation that anyone gives is mostly speculation, personal interpretation and opinion. So, in his dream Jacob saw a ladder reaching from earth to heaven, with angels ascending and descending on it. Above the ladder stood the Lord, who (and we must assume that Jacob ascended the ladder) covenanted with Jacob, as he had with Abraham and Isaac, to bless him and his posterity throughout all generations. You are not way off in suggesting the ladder refers to progression of knowledge. The rungs on the lader might represent covenants we make with the Lord as we progress towards perfection. The second, Terrestrial understanding, or receiving Christ into our souls and possibly seeing Him. These two levels can be achieved in this life. The third, Celestial understanding, or receiving the Father and all He has; something that would happen in the next life. The ladder symbol is evident in some of our temple designs. 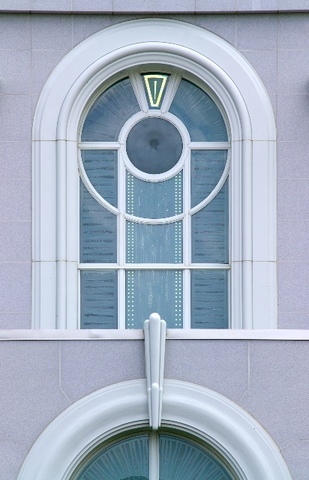 The Mount Timpanogos Utah Temple has in it's tall rectangular windows the symbol of Jacob's three rung ladder leading up to heaven.